ABOUT THE SITE—The site is a KALI Temple establishment at about 25 kms SE of Ara .The premises is spread over in an area of about 100 acres.There are three gates to reach the garvgrih of the temple. The first magnificient gate inviting entry is about 60’ high Second gate lead s to the temple platform The third gate gives entry to the temple garvgrih after rising a few steps. Local say and few records show that this site existed since 1862AD. The temple was very ordinary.There was a high land which was used by local people as Akhara in Chait nawmi.The village used to suffer from different ailments. But in 1948 a dream came to a local priest. He was commanded to clean the premises and establishaKali temple there.He told the villagers.They also endorsed the idea all combined and Kali temple with 9 Durga pindis was established.The worship gave colour to the establishment.Villagers were freed from ailments and diseases.Those who were much benefited donated much to it. Present grown up shape of the premises came in 1999 .It has its own rest shelters to stay school for children etc. 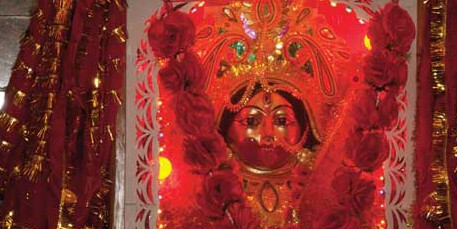 FESTIVITY—Besides day to day worship Chait Ram navmi and navratra Durga puja is the main festival celebration at the site.